Are YashRaj Films really in trouble? 1. The films produced by Ronnie Screwvala were used as the UTV produced films, and I relied on Ronnie’s IMDb filmography with assistance from other sources (my other sources were Hardik and Doga in the SB). 2. The films produced by Aditya Chopra were used as the YRF produced films, again based on memory, and IMDb filmography. 3. Films distributed by either UTV or YRF were left out – although films like RACE and Taxi 9211 fall into a grey area where they were apparently sold to UTV – but since IMDb listed UTV as producers I included such films. 4. The nett gross and distributors shares were based on BOI numbers, as were the verdicts, overseas gross, and overseas verdicts. 5. BOI lists the overseas gross of only the top films (their list ends at 90 films) so I went to Boxofficemojo for some numbers. Finally, the data is presented as two charts – the first is a straight year by year listing of UTV and YRF productions with film names, numbers and verdicts. The success (anything that was average and above) versus the failures is presented at the end. The second compares the last 4 years of productions for both UTV and YRF side by side. 2. The reports are wildly disparate from source to source and unreliable. 3. The film verdict is supposed to fold in cost, so I am treating the verdict as a surrogate for cost for now. It would be fun to redo this with costs, if people want to provide me with what they have. And I am new to the numbers game so I welcome any input you may have. Finally, many thanks to Hardik for helpful discussions in the Shout Box. 1. UTV do a valuable service is providing funding for and distributing niche films. This is a good way, probably the only way, for these films to see the light of day. 2. UTV are also producing a mix of big and small films – all the way from Jodhaa Akbar, Rang De Basanti to Aamir. 3. YashRaj Films are a behemoth, and UTV cannot really compare in terms of sheer volume of business that YRF do. 4. The YRF model is a star focused one, and small films are rare. However, the recent Kabul Express, CDI were unusual films for the stable. They also made two female centric films that did not do well at the BO. 5. Marketing wise there is not much that YRF do to market their films. Thus CDI, RNBDJ and AN all saw very low-key marketing. Perhaps they believe their name and the stars are enough to get the crowds in. Some lessons in marketing would be good for these guys. 6. UTV marketed Race, and JA and Delhi 6 very aggressively – to mixed success. In fact they seem to be unique in having no film that is bigger that a hit! Either this reflects high film costs or low collections. Their niche films are rarely better than an average success. That means they risk small money on small films and make a small profit. 7. 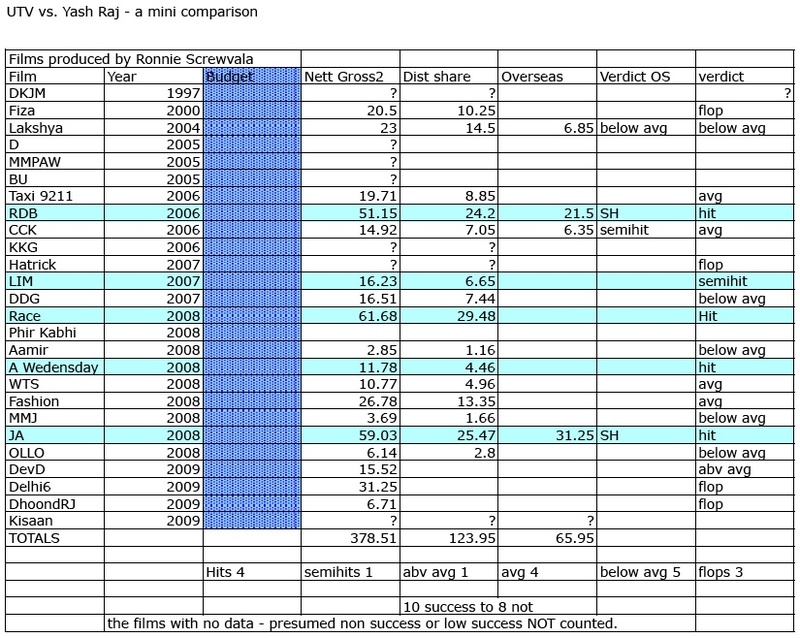 In contrast YRF risk big money on almost every film, and average one film that is Superhit to Blockbuster every year. Does this mean they earn big returns on a few films and lose money on others? My guess is no because of the huge profits they make overseas. 8. The key comparison is in the overseas market. There YRF make a killing, every year, and with almost every film. Their overseas take nearly equals what UTV make in the domestic market. And UTV have limited to no success with the niche films overseas. 9. Overall – I think no one needs to send aid checks to YRF! They are making big films because they can, and the overseas success of their films, coupled with one to two big films each year, ensures that this family owned business will be the leading film production company for a few years more. 10. The gap is narrowing though – and each year UTV is slowly becoming more successful. 2009 will give them successes in Dev D – and perhaps more. But to balance that there is the flopping of Delhi 6. In fact there is a lesson here for both houses (in broad generalizations of course). UTV is not doing half as well in the big films as they are in the niche films so they cannot grow rapidly with huge successes. Is that an issue with marketing, star selection, content? Their best success came with Aamir and Hritik. Hritik’s infrequent outing, and Filmkraft allegiance, and Aamir’s focus on his own productions no doubt caused them to look to Abhishek. But Abhishek is a most inconsistent star at the BO so who will carry the UTV banner forward in big films? Their success in niche films is also of a very modest nature – the films are average or below. Is it because the audience is just not ready, or is this a fault of marketing etc.? YRF are doing poorly with their experiments – the female centric AN and LCMD, the animated RR. That seems most likely as issue with content; fixable, but will it happen? Their hiring of Jaidep Sahni and Shimit Amin seems to be a step in the right direction. And the biggest worry for YRF should be the aging superstar they have most often gone to the bank with. Perhaps that is the reason we see a focus on Shahid Kapoor, Ranbir Kapoor, John Abraham and Neil Mukesh in upcoming films. Films may flop these days but no one loses money, that is what we hear. The music, satellite, DVD, overseas provides enough to cover costs and make some profit. These newly minted stars have LOW clout in the overseas BO though. And that was a huge source of YRF income. This will make the playing field level between UTV and YRF in the years to come, unless some new method is developed to engage overseas audiences. But for today – YRF are a big and very comfortably successful business. excellent post pakhi . there should not be any credit to me in this post . i just checked the table u made . did nothing myself . YRF has one blockbuster since last three years. But where UTV scores is that since 2006 you will find hardly any flop by them. Another thing is that their movies apart from BO success were critical success also. YRF is not outscored by UTV , but still UTV is marching ahead and YRF is movie downhill. Their Flops in last year like Tashan etc are not just flops, they are disasters. what is the point of having averages when a single blockbuster can give yrf more profits than utv . also even though utv may get their niche films to average YRF get larger section of audience . their films open at min 10 crores compared to utv whose take entire run to get there. That is true Hardik – their single flop can earn more than the entire assembly of UTV niche films. 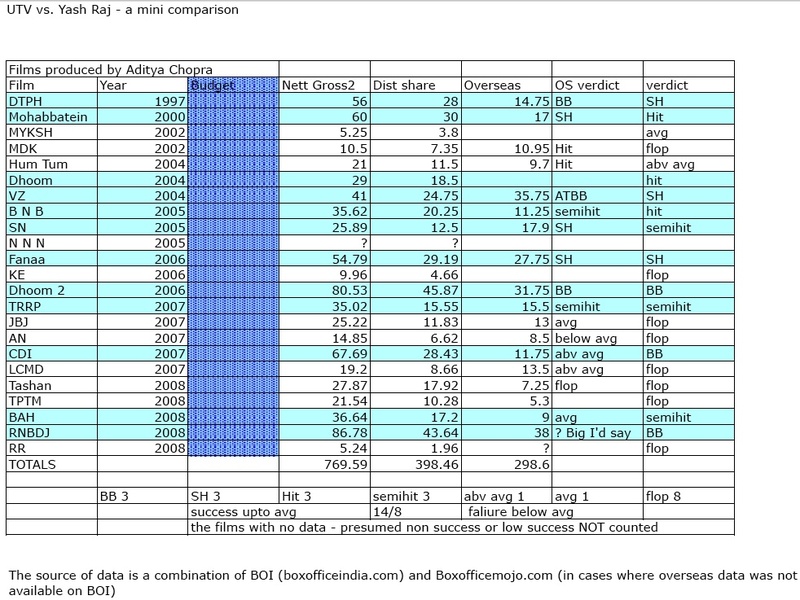 One cannot compare the collections of modest-budgeted films like A Wednesday or a WTS with that of Tashan or AN.One has to look at the ROI for each of those movies.While Tashan and AN could not recover their costs in the domestic markets,virtually every film of UTV(since 2008) has recovered its cost. If YRF produces a movie worth Rs 100 and earns Rs 70 while UTV makes a movie worth Rs 10 and it earns Rs 20. Of course,70>20,but who is the loser here? I agree that trade insiders will be much more happy if a YRF-produced movie doubles its budget in BO collections because that would mean a profit of Rs 100 (using above example)as opposed to Rs 10 from UTV.But except for SRK-starrers ,that is not happening for YRF. Manoj – Tashan collected 37 cr from India and overseas – so it lost NO money! And satellite, music, DVD made a tidy profit. If a 30 cr movie makes a 5 cr profit then that is better than a 3 cr movie breaking even. 37 crore for Tashan translates into approx. 20-22 cr to Yashraj. Fair enough RKS, but the music was extremely popular and a chart-topper, add to that DVD and satellite revenue, and there is no way there was a loss on this film. pakhipakhi – what is ur email address ? If you are Hardik then I sent you an e-mail already from my e-mail address. agntsmith@rediffmail.com . did u send it on this ? One can only make estimations and conjectures as to how much the DVD sales (if there were any! ),satellite rights and music of Tashan or AN would add upto.There is no site that throws any light on this matter.May be they were enough to break even with the budget ,may be not. But as far as the theatrical run is concerned ,YRF has been a loser. Manoj – I know there were DVD sales as I OWN one! And it was sold out for a while before I managed to buy it. The music sales are well visible. And YRF market their own music and DVDs there is no middleman like T-Series or so.